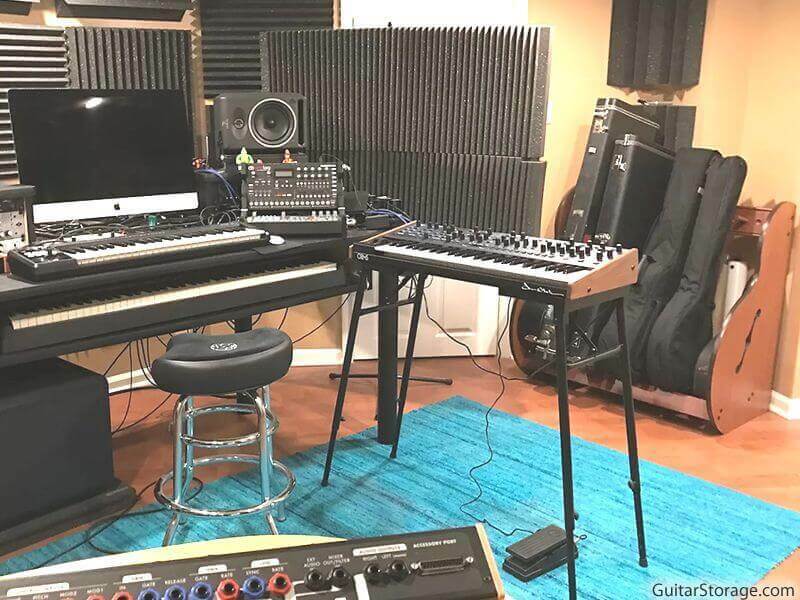 If your guitar cases are making a mess of your music room or studio, here’s just the solution you need to get organized: the Studio™ Standard Guitar Case Stand. This rack is designed to fit the full range of styles, from hardshells and gig bags to road cases and more. This decorative case rack features hardwood rails and simulated wood grain royal cherry sides. It offers you the same capacity and functionality as our Deluxe model, but at a more economical price. The adjustable hardwood dowel separators will securely hold your cases of all different shapes and sizes. And you can quickly and easily assemble this product with just a hex wrench (included). Additionally, if you'd like to be able to easily move the rack around the room, we now offer an optional wheel kit add-on (drill required for assembly). Consolidate your collection, save space, and get a nice piece of furniture too! And if you’re a searching for a great gift this Christmas, Birthday, Anniversary, etc., you’ll be sure to knock it out of the park this year with the Studio™ Standard. Q: What are the STANDARD model side pieces made from? A: The curved sides are made of simulated cherry wood grain, scuff-resistant, high pressure laminate over an MDF wood core. The 3 support rails are solid hardwood. Q: What are the DELUXE models made from? A: The side pieces are made of real wood veneer over an MDF core, with herringbone inlay along the edges. The 4 support rails are solid hardwood. Q: Will the full-size Studio™ Guitar Case Rack definitely fit 7 to 9 cases? A: The number of cases that can fit on the full-size Studio™ Guitar Case Rack depends on the widths of each of the cases. Some cases are wider, some cases are narrower. To maximize the storage capacity, you could remove the dowels/separators to gain approximately an additional 7 inches of storage space. The best way to determine this is to measure all your cases and see if the total is less than 48 inches. Q: Can I order one with wheels? Q: Can I order a custom size version? A: From time to time we are able to do a custom width product. Please feel free to contact us and we'll let you know if we can do it at that time. Note - additional charges would apply. 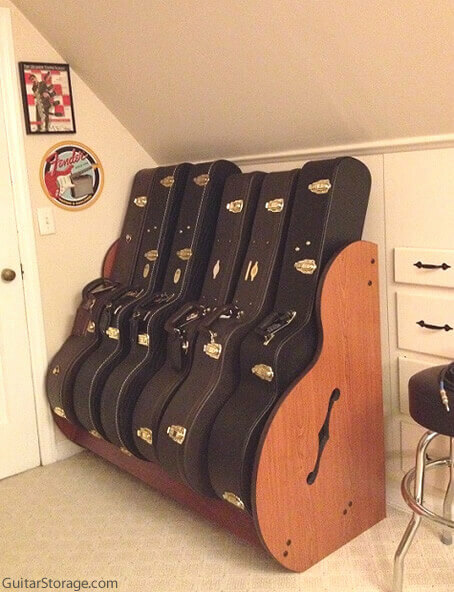 Q: How high will my guitars sit from the floor? I keep my guitars in my basement and always worry about flooding. 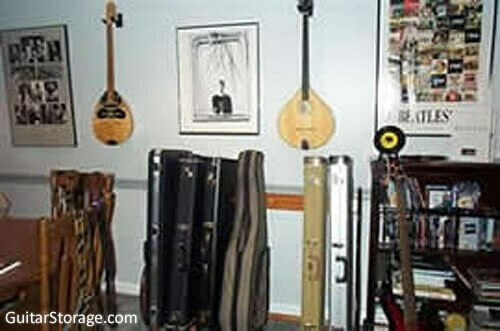 A: Guitars and cases, when on the racks, sit approximately 3 inches above the floor. Of course, if flooding is a threat where you live, we strongly encourage you to avoid keeping your guitars in a basement. Q: Can the rack be placed directly against the wall? A: Because the guitars/cases need to lean, you will need a few inches of clearance. Anywhere from about 2 to 7" depending on the rack and guitar or case size. Generally the larger Double-Stack racks need a little more room than the single racks. "My wife is especially happy"“It went together easily and it is very stable even on carpet. Glad I bought the standard model size. My wife is especially happy that my guitar cases are no longer stored in the coat closet and strewn over the floor. Thank you for a great product and your assistance!” - Jerry A. "Outstanding product"“Outstanding product. Easy to assemble.” - Dennis B. "totally satisfied"“Not only are your racks very well made, but they are also a good looking piece of furniture. I am able to display a portion of my collection (although cased), which makes my studio absolutely awesome. I wanted to write and tell you how totally satisfied I am with your product and that the racks are certainly worth the money! Keep up the good work.” - John T.
"great idea"“Guitar Case Rack assembled and working: now I don’t have 9 cases scattered in the room… :) Thanks guys, great idea!! !” - Max M.